I Confess. 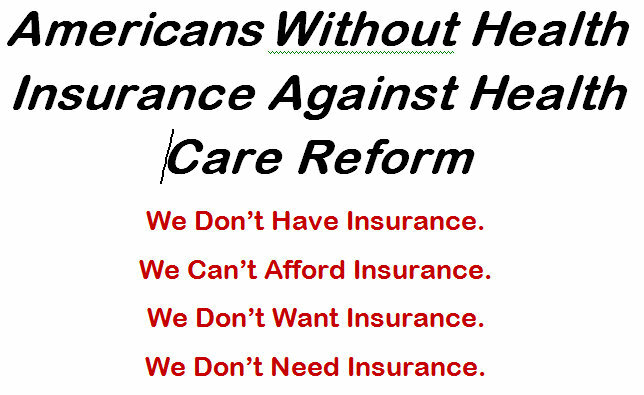 This is Something I Never Thought I’d See: Americans Without Health Insurance Opposing Health Insurance Reform! It turns out that an active group of the over 30 million Americans without health insurance — adults and children who scrimp on medications and doctor’s visits — have joined to oppose health reform. Here they are, and their arguments are unusual to say the least. You make an excellent point about opponents to the health care reform not being informed on the parties that are least represented, those who are uninsured. That question is rather irrelevant to most of the bills opponents as they are largely fueled by self interest rather than societal interest. Have any opponents replied to your questions? Oh and by the way, I did believe you for a second. No I haven’t heard from anyone. It still strikes me a simple question: Are the voices of those without insurance being heard, being considered? You got me for a second, and all I was thinking was, “Who in their right mind..” But what it comes down to is people/industries protecting their interests, happy with the status quo. I hate to simplify it to that, but often the arguments I hear against it are just that. I brought up at work that even if it came to paying a little more on my taxes so that every American had health insurance, I would gladly do it. Well, the notion was inconceivable to my boss, and apparently to many others who only see the bottom dollar in all this as opposed to a better, healthier society. Where have the communal, altruistic feelings gone? Where have people like Joann gone? This i feel is a portrayal of the realities of a capitalist hierarchy. Those who can’t afford it, don’t want it and find that a reason to say that, that’s why they don’t need it. There are people who embrace this uneven socioeconomic stratosphere, and instead of going along with “dominant ideology,” (I can have health insurance if i work hard enough), they succumb to their own state and admit that theycan do without it.